The renowned Japanese writer and director Hirokazu Koreeda has made another profound but relatable film. This little jem is exactly what you need to understand life with family a, especially if you have been through a divorce or been a child of divorce. Ryota Shinoda is not dealing with his divorce well or the death of his father, as a disillusioned novelist that became a private detective he isn't the anti-hero we hoped for. With a penchant for gambling, chronically late, a bad liar that stalks his ex-wife you don't exactly want to root for him but you do anyway. His relationship with his son is wishy-washy at best, but with the advice from his mother and sister he tries so hard to be there for him (even though he falls flat on his face every time). With his get rich schemes of betting on the races not panning out, he has to find another way to provide for his family. Held up in his mother's apartment for tsunami season with his ex-wife and son, he has to deal with his past mistakes head on. Hiroshi Abe gives a incredible performance as Ryota, the frustration to make more money fuels the character to conduct more risky business moves (that just make you wanna slap the back of his head). Ryota's mother is played by Kirin Kiki is astoundingly adorable as the voice of hope which was met in contrast to the voice of reason played by Satomi Kobayashi as the older sister aka "the good daughter". 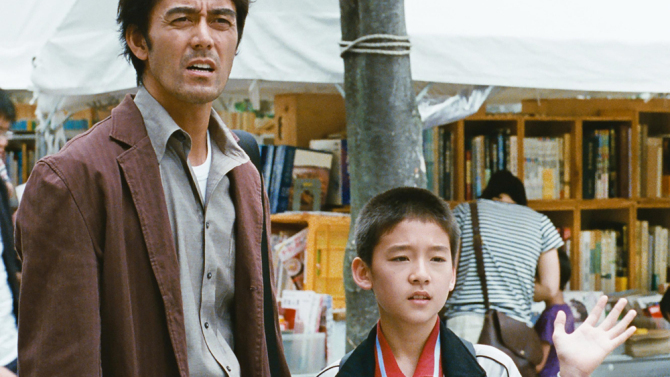 The real acting that was struck by was the son played by Taiyô Yoshizawa for how young of a actor to show proper disdain for a deadbeat dad that makes promises he can't keep. His ex-wife played by Yōko Maki has heard it all before and is tired of it all. With the impending tsunamis gives the entire film a feel of the build-up of emotions from all the characters that need to be let out wave after wave. The color of the film is kinda deluded which gives it a nostalgic feel, but I also think is a physical manifestation of Ryota's deluded sense of how bad he screws things up. Overall I truly enjoyed this film I always love it when characters are honest and real. Not a caricature of a person, but has flaws and problems. People are not perfect and this film depicts it accurately plus it's worth the ticket.